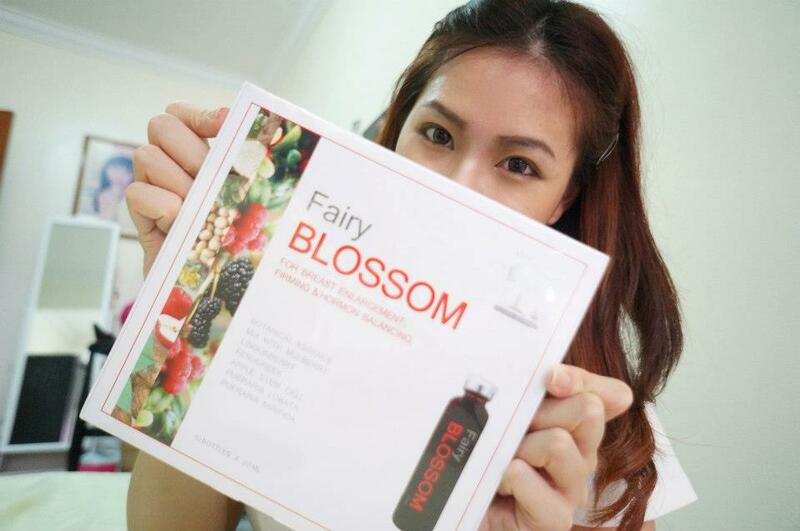 HI ALL, i get a know a new beauty supplement product lately..which is Fairy WHITEZ and Fairy BLOSSOM. It is made by natural ingredients, which is Lingonberry and Mulberry plant. Lingonberry is rich source of fibers, sugar, vitamin A, vitamin C and magnesium. The mulberry plant had an important role in tradition Chinese and Japanese medicine and research shows several benefits of mulberry extracts. It is taken to reduce the symptoms of arthritis and bone pain, to promote healing, or to improve the appearance of the skin. It is formulated in New Zealand. 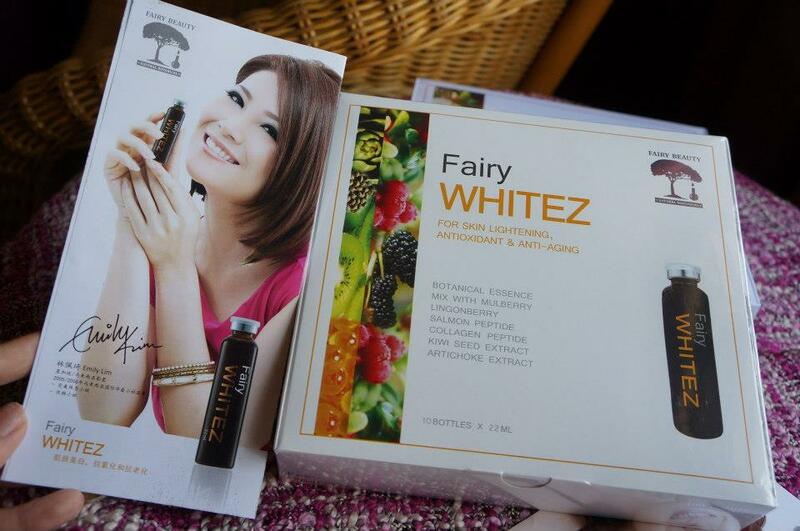 Fairy WHITEZ is for skin lightening, antioxidant & anti-aging. The key ingredients included Salmon Calcitonin Peptide (Placenta), Collagen Peptide, Artichoke Extract, Kiwi Seed Extract and Amino Acid + L-glutathione. The skin thins and losses collagen by aging; its blood supply is diminished and results in dull, dry, wrinkled and sagging skin. Fairy Whitez can help remove minor skin lesions and re-thicken the skin. 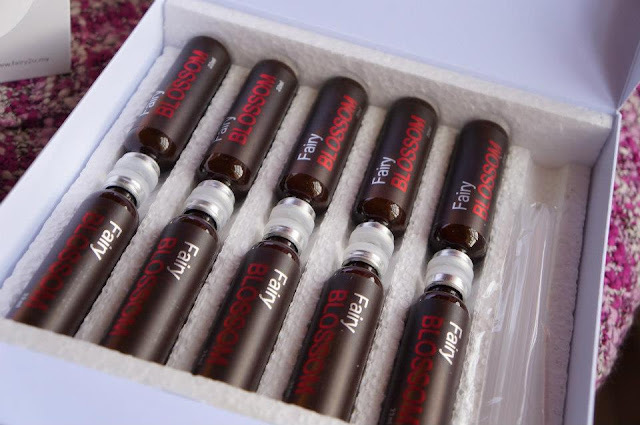 The structures of collagen and elastin are rebuilt and skin's blood supply is improved by this beauty therapy of Fairy Whitez. 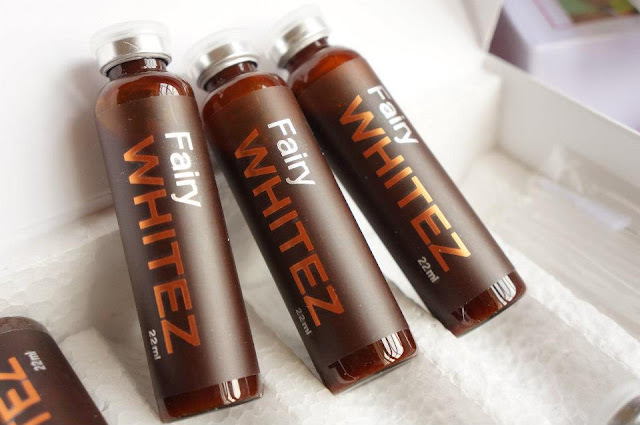 Fairy Whitez is an anti-aging and skin-lightening beauty instant drink, essentially made from marine peptide and plant extracts. 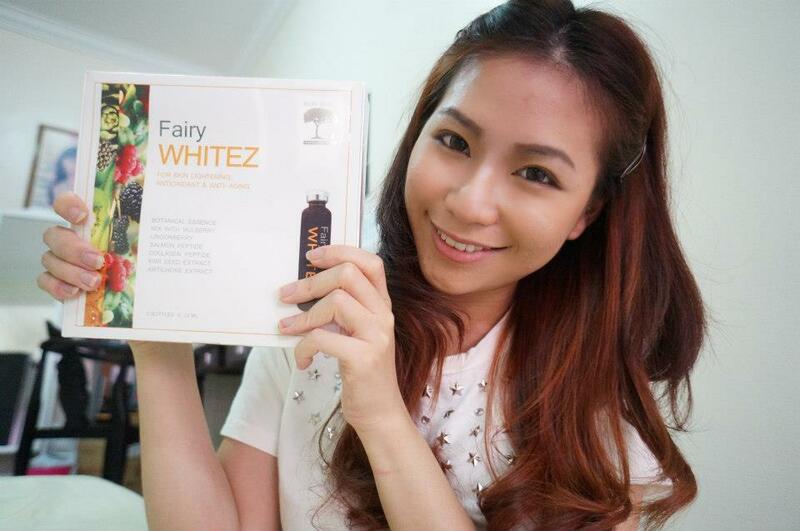 The core ingredients of Fairy Whitez enhance skin complexion and restore a smooth and youthful skin. The major functions include preservation, restoration, healing and structuring of vital collagen and other building blocks of the skin. The awakening and regenerative properties of Fairy Whitez are specially formulated for mature skin to revive a youthful, resilient and translucent happy-skin. It is the true solution to your mature concerns. suitable for adults age 16 and above. Don't worry, there won't be any side effect consuming Fairy Whitez. It's all made by natural ingredients under strict quality control and quality assurance to ensure safe functional products. You can see differences of your skin in 10-20 days. I think my skin really looks firming after two weeks of consuming Fairy WHITEZ. 1. Decrease the appearance of wrinkles and fine lines. 2. Firming and uplifting the skin. 3. Promote cells and tissues regeneration and improve blood circulation. 4. Restore skin elasticity and tighten skin pores. 5. Improve moisture retention: promote smooth and plump skin. 7. Promote skin-lightening effect and prevent formation of pigments. 8. Anti-under eye dark circles. 9. Strengthen the flexibility of joints. 10. Encourage hair to grow thicker and promote healthy nails. 11. Contain antioxidant properties to fight against harmful free radicals. 12. Nourish the body with vitamins, minerals, amino acids and antioxidants to enhance body's healthiness. The second one is Fairy BLOSSOM. It is for breast enlargement, firming & hormone balancing. The Key Ingredients included Apple Stem Cells, Pueraria Lobata and Pueraria Mirifica, Fenugreek, Soy Isoflavones and Natural Amino Acid + L-gluethathione. Every drop of essence contains the purest energy of revival and regeneration- phytoestrogens, chemical substances with properties that mimic the actions of natural female hormones to promote breast firming and development. In addition, they help in hormone regulation, which aids to alleviate a variety of discomforts and symptoms caused by hormone imbalance. 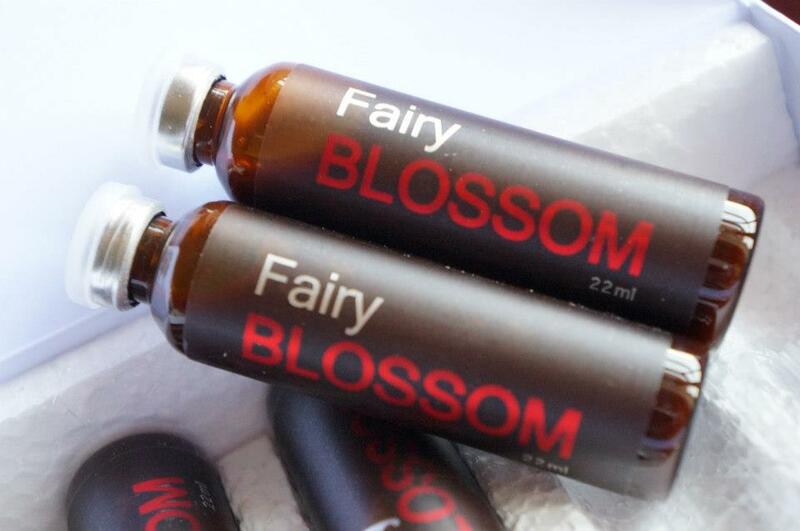 There is no side effect from consuming Fairy Blossom. Fairy Blossom is made by natural ingredients under strict quality control and quality assurance to ensure safe functional products. (as i mentioned earlier) About 10-20 days consuming the products can see the results. Every individual response differently to supplement they consume. 1. Develop fullness and plumpness of the breasts. 2. Firming and uplifting of sagging breasts. 3. Firm up hips line. 6. Alleviate pre-menstrual tension and menstrual problems. 7. Reduce and delay menopausal symptoms. 8. Enhance the quality of sleep and prevent mood swings. 10. Nourish the body with vitamins, minerals, amino acids and antioxidants. Btw, I did a vblog for this product. Sorry, i'm pretty nervous because it's my very first video!! My very first time taking to the cam, NG for so many times. LOL! Spent so many hours for this and finally it's done! Phewwwwww! I'm sorry if it is not good.